Dinner for the family and of course, the red wigglers!!! Tonight, as a request from the family, I made a favorite dish. Sausage, peppers, onions and garlic on a loaf of fresh bread with melted cheddar cheese is a very filling, non diet type meal, but oh man is it tasty! 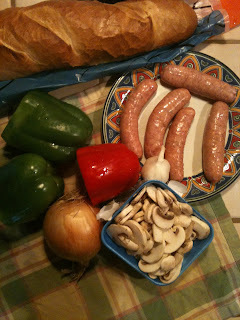 While I was washing the peppers, I thought about writing this blog to show the scraps that would be fed to the worms. As I am typing this, I have to avoid looking at the picture because I am so full and the sight of the sausage is making my stomach turn. 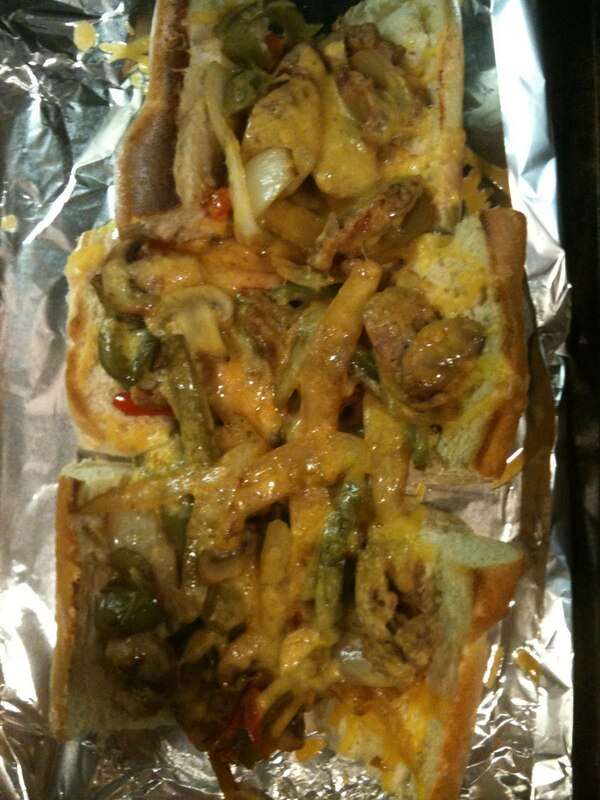 I am not much of a sausage eater and decided a few recipes ago to change from pork to turkey. In this dish, you really can’t taste the difference. I think the veggies mask the flavor. So after all of the slicing and dicing, this is what is left for the red wigglers. 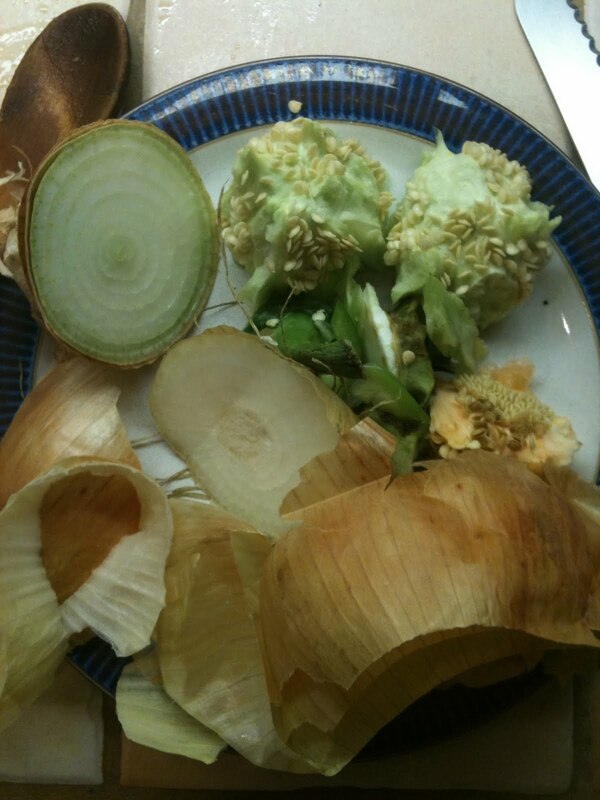 There is the onion’s top and bottom and a bit of its outer layer. Although many vermicomposters say to avoid onions, I have found that maybe one onion a week is not so bad. There is also the center and top stem of the peppers. When it’s time for me to dump them into the worm bin, I will make sure to get rid of the seeds. Not that the seeds will harm the worms, they won’t eat them and will be left behind in the compost. I thought it would be cool to share the final, yummy dish. The picture looks odd to me!! Not too appealing, maybe because I ate so much of it and I am full!! On a side note, not worm related, I grew up eating this awesome sandwich at Italian Feasts on Long Island many, many years ago. So many memories come rushing back each time I start cooking! They were all over them this afternoon! Yipee! cause I love them toooooo! What’s on the Menu for Red Wigglers? What’s on the menu today for Wonder Worman’s Super Composting Red Wigglers? There’s Red Leaf lettuce, banana peels, strawberries, oats, pasta, rice and spinach, among other things – Food scraps from the last couple of days. If you have kids and are looking for ways to get them even more excited about having Red Wigglers, make a project out of feeding your worms by creating a “soup” out of food that would normally go to waste – but still a good source of food for your Red Wigglers (Moldy bread? Bring it on! Rusty Lettuce? Yum!). Before putting this mix into the bin, add a bit of water to prevent any moisture from being absorbed by the mix from the existing bedding. Bon Appetit!